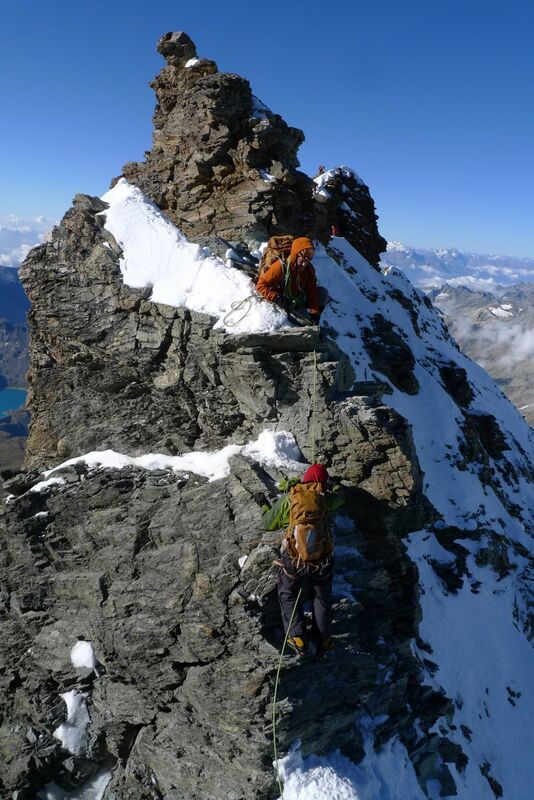 The race for the summit of the Matterhorn began before the peak had ever been attained and yet still continues today. 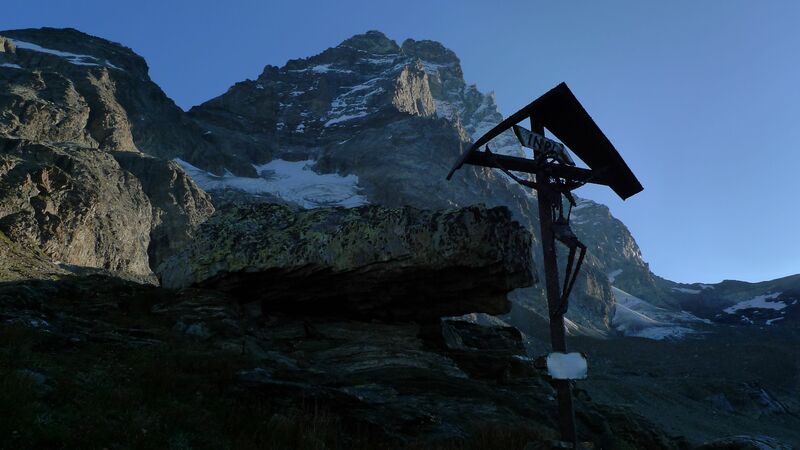 In 1865 Edward Whymper came to Cervenia Italy, in the Aosta valley, fresh from the first ascent of the Aiguille du Verte in Chamonix. 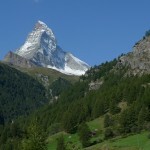 He came to hire Jean-Antoine Carrel, the Italian guide he had hired the previous summer, to attempt the unclimbed Matterhorn. 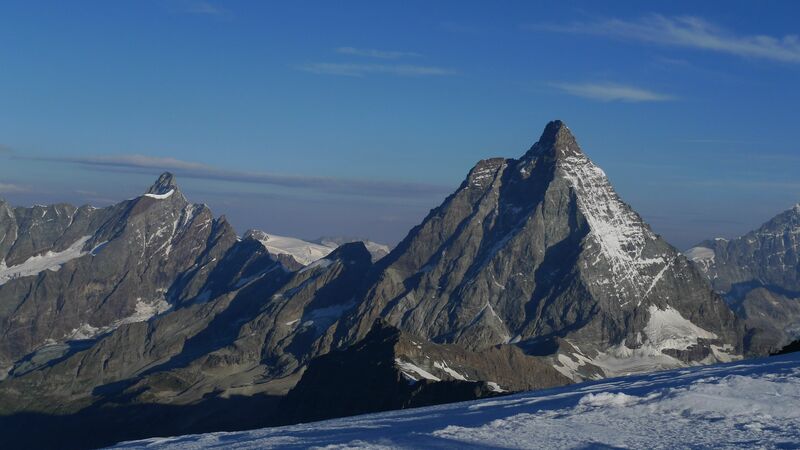 When Whymper arrived in Cervenia he discovered that Carrel had just left with another team to attempt the Matterhorn by the west ridge. 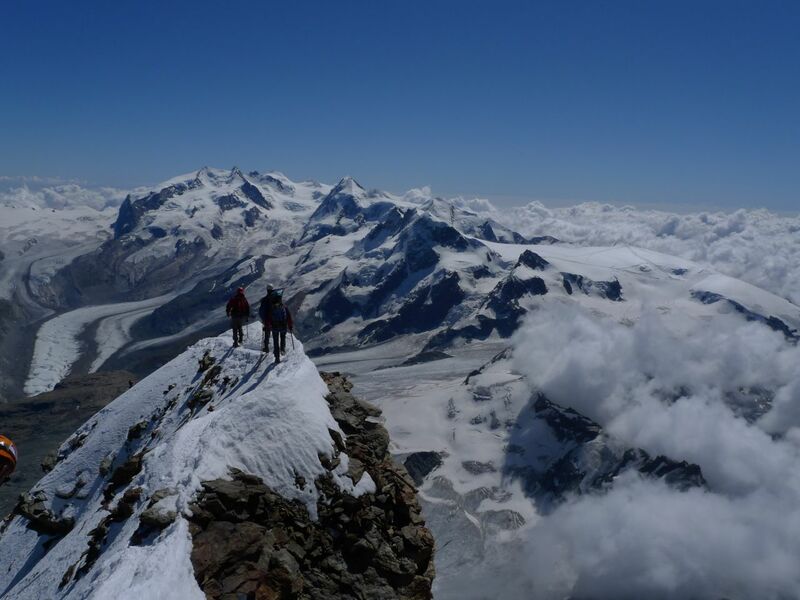 Disappointed Whymper set off for Zermatt Switzerland on the other side of the mountain to assemble his own team including Chamonix guide Michel Croz. 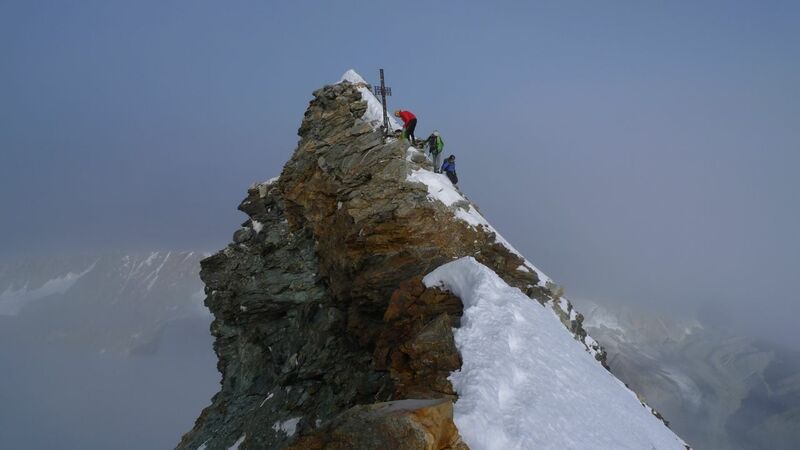 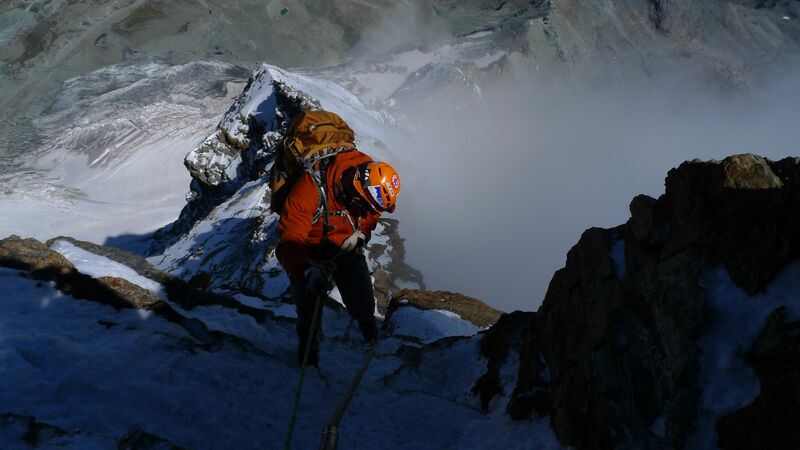 With in a day he was starting up the East Ridge from Zermatt with a team of seven, eager to beat his former guide to the summit. 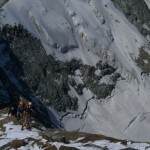 The East Ridge had previously been avoided because it was thought to be more difficult. 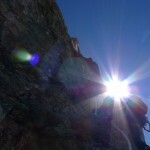 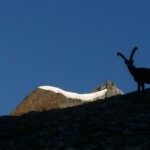 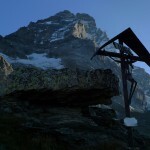 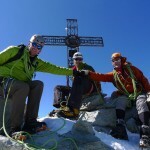 The next day, July 14th, Whymper stood on top of the last great summit in the Alps to be climbed. 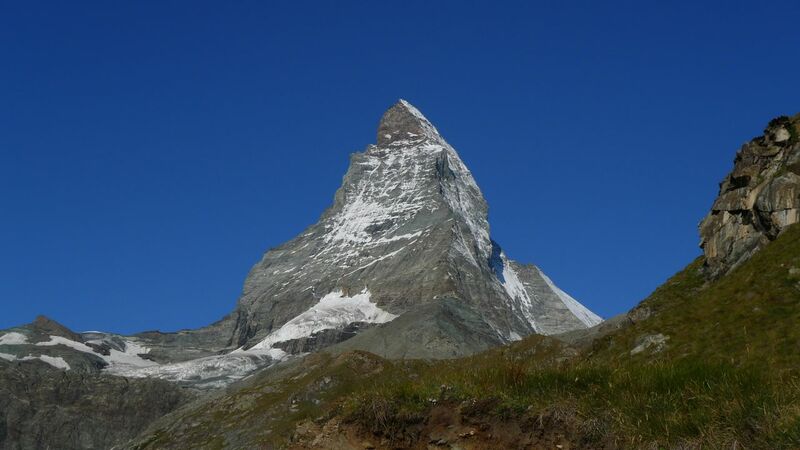 To notify the Italian team that they would not be the first team to the summit Whymper’s team hollered out and sent rocks down the west side of the mountain. 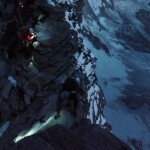 Victory was sweet however short lived as tragedy struck on the descent. 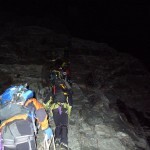 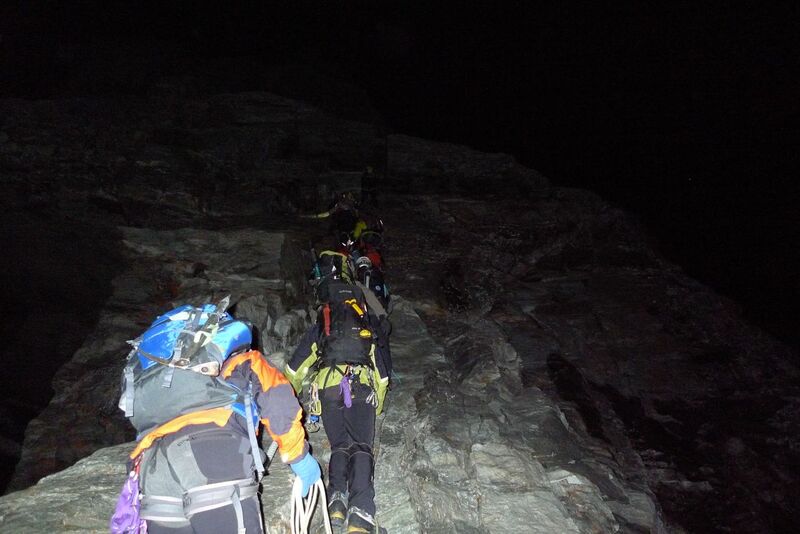 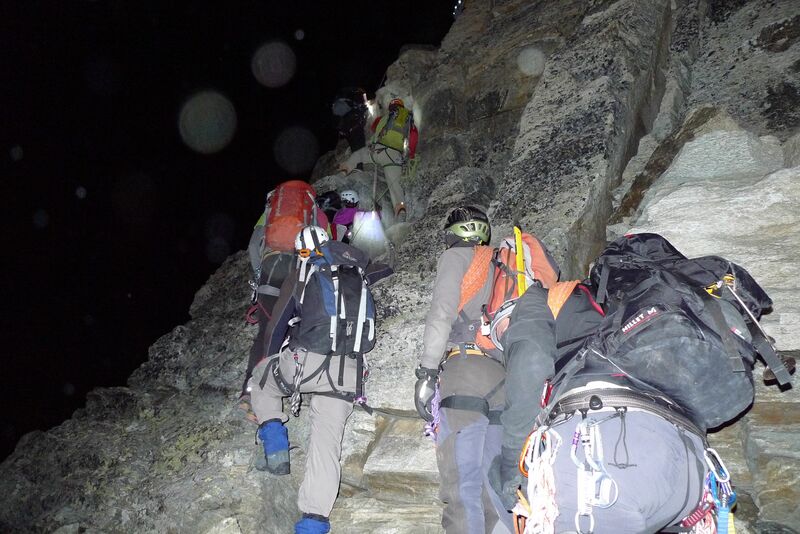 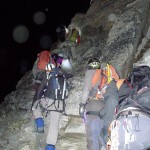 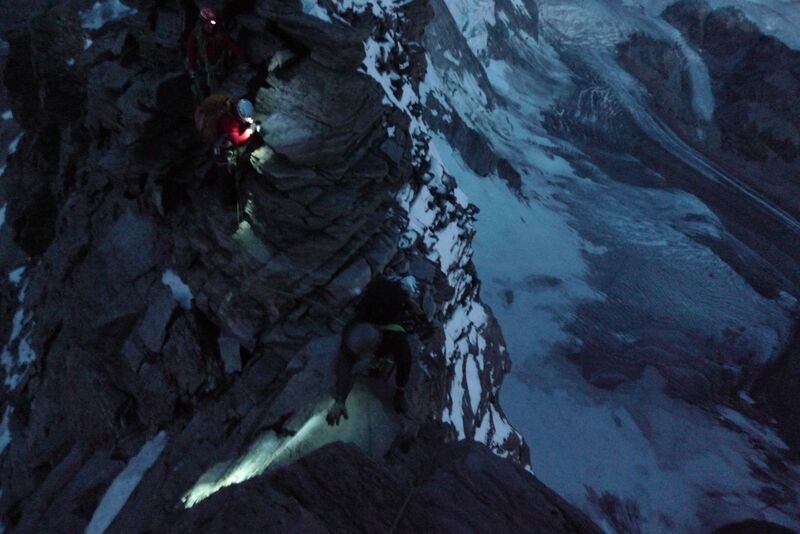 A slip became a fall and all seven members of the team were swept down the mountain tied together. 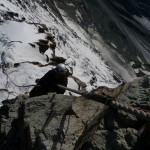 Whymper and two other members would survive when the rope was cut and four team members perished. 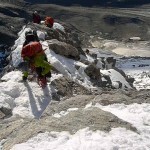 This ascent and accident brought great criticism on Whymper from which he never really got over. 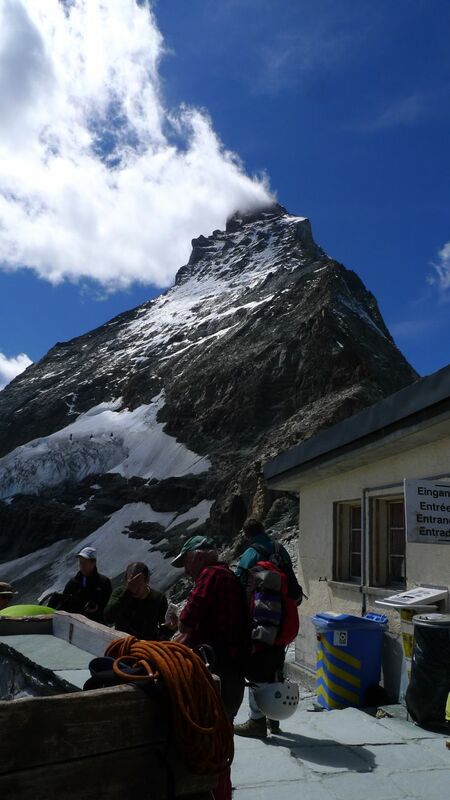 Now the race to the summit of the Matterhorn is simply a battle of pride to get to the top and back down to the Hornli hut merely to be able to smugly drink a Henniken while the lesser teams stumble in. 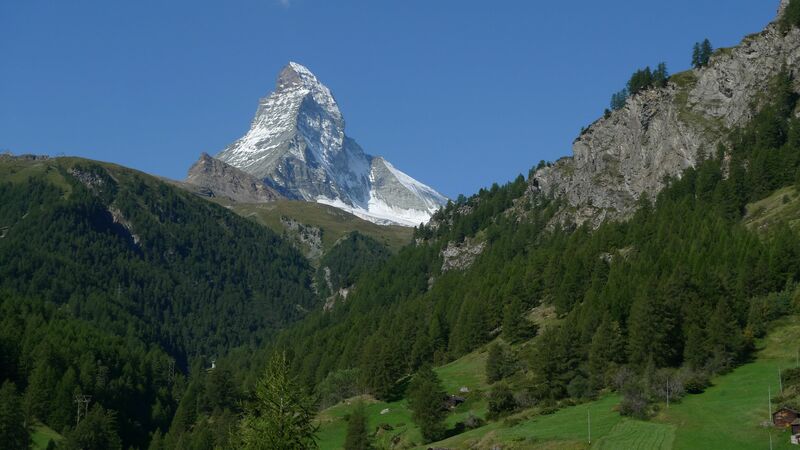 The Matterhorn is a beautiful mountain that is the definition of horn shaped. 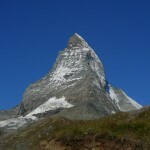 Carved from glaciers creating a four-sided pyramid with the ridges facing the four compass points. 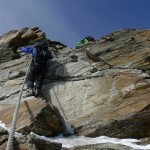 Today the two most popular routes are still the two routes used to gain the first and second ascent of the peak in 1865. 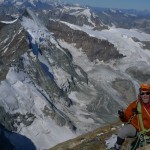 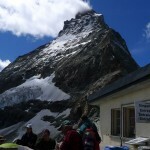 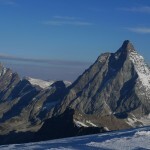 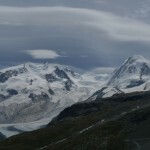 The East Ridge is known as the Hornli ridge and is seen from the mountain town of Zermatt. 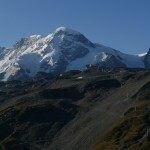 The West Ridge is known as the Lion ridge creates the left hand skyline as seen from the town of Cervenia. 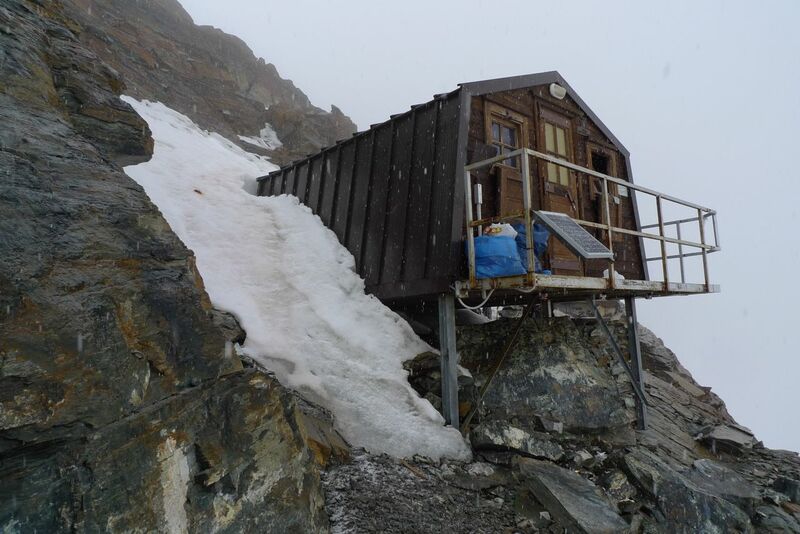 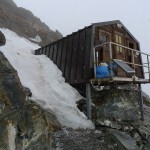 Both routes have huts that support attempts and both routes now have extensive fixed ropes to assist the ascent. 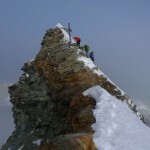 Yet they have a very distinct feel from each other. 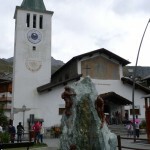 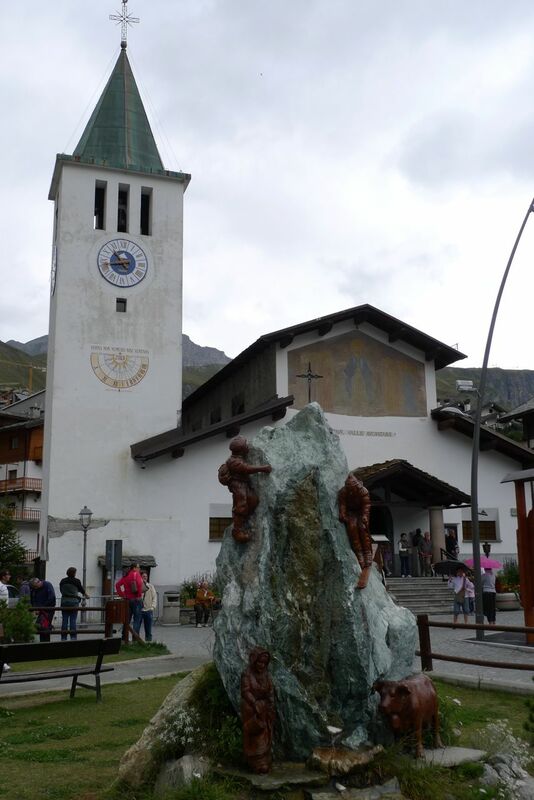 The difference may be as simple as the cultural differences between Italy and Switzerland. 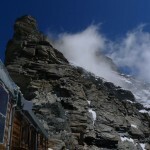 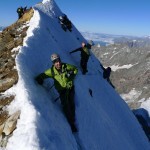 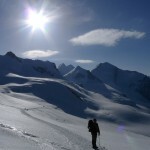 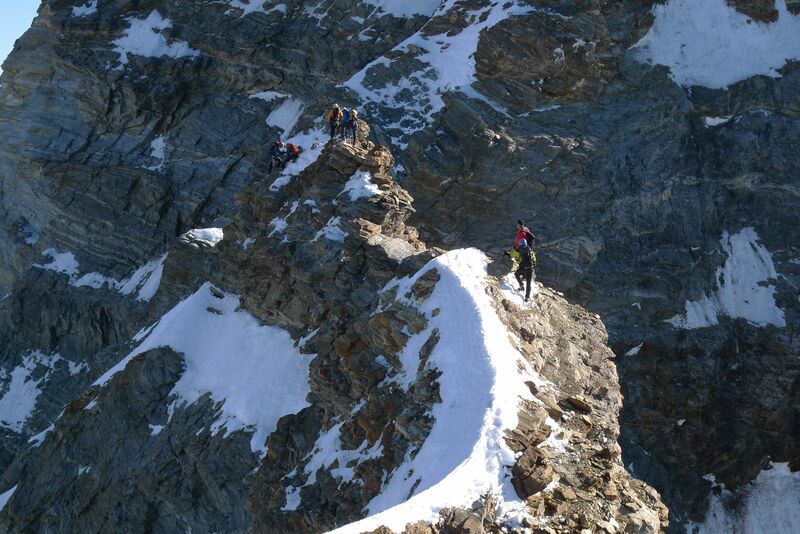 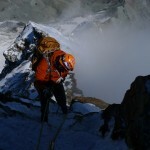 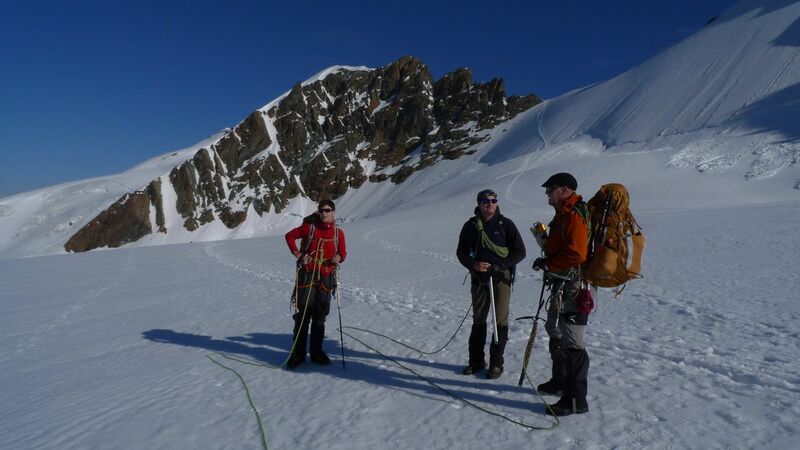 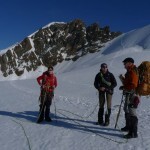 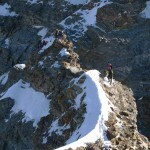 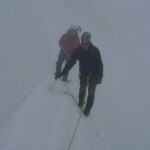 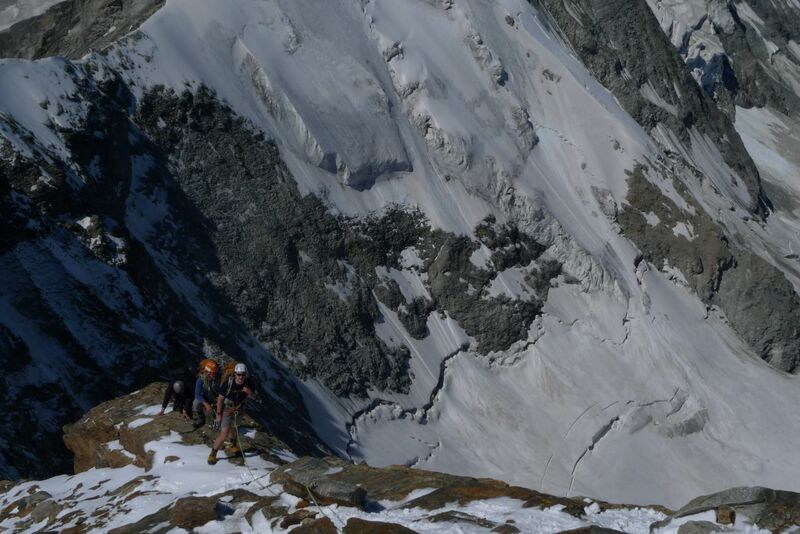 The Hornli Ridge launches from the Hornli hut and roughly takes 5-6 hours on the ascent and the same on the descent. 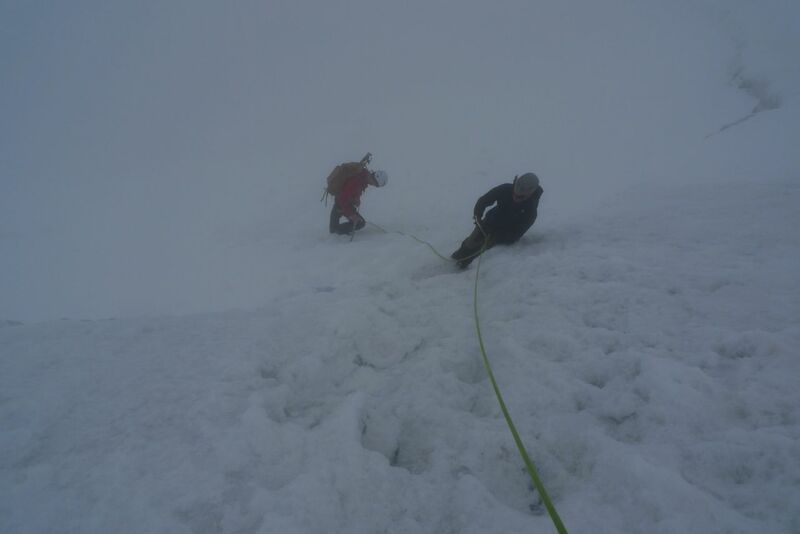 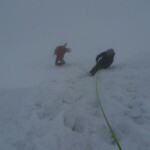 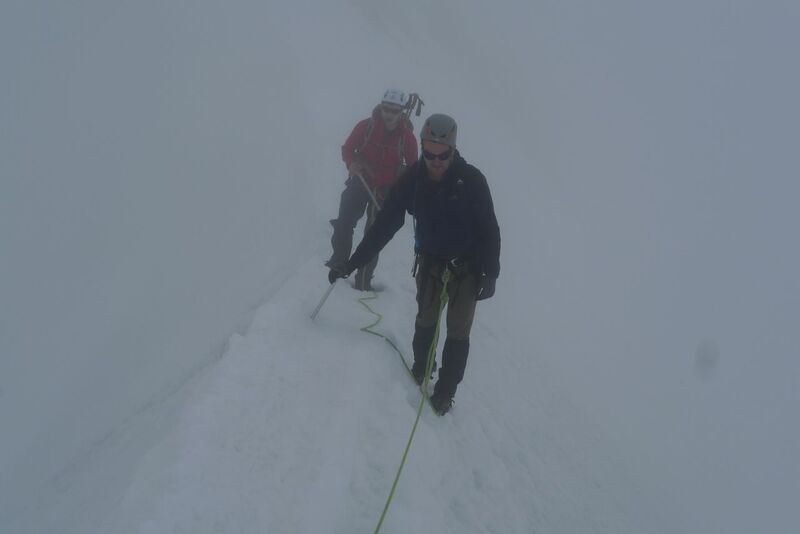 The difficulties are primarily route finding in a few sections and moving quickly over snow/rock/ice with extensive fixed ropes. 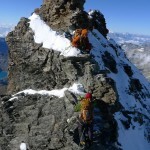 The route is long 1,300 meters, and requires moving in tandem up and down to make the climb with out an epic. 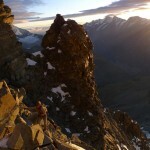 The Lion Ridge launches from the Carrel Hut located on the ridge proper and requires technical climbing to gain. 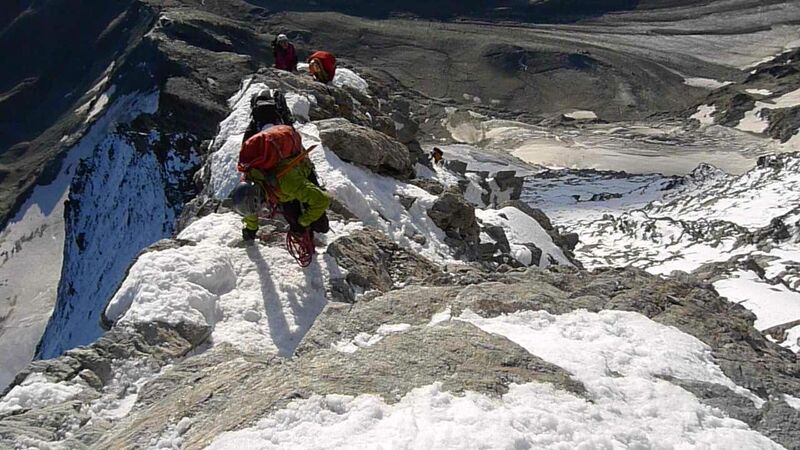 The Lion is a shorter ridge only 800 meters how ever it is more complicated both with more difficult climbing and varied terrain climbing up and over Pic Tyndell. 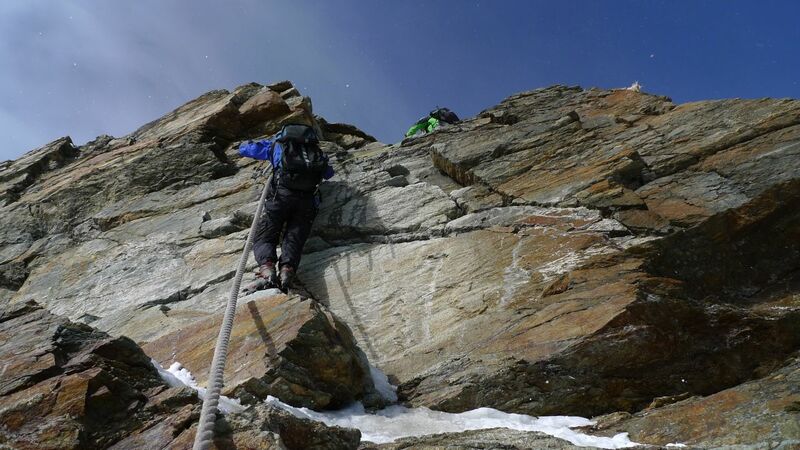 There are fixed ropes along the route as well as an old wooden ladder for the crux however the over all climb feels more complicated than the Hornli Ridge it is less crowded so for many it may be worth the added challenge. 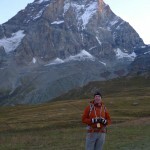 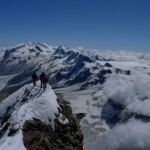 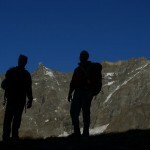 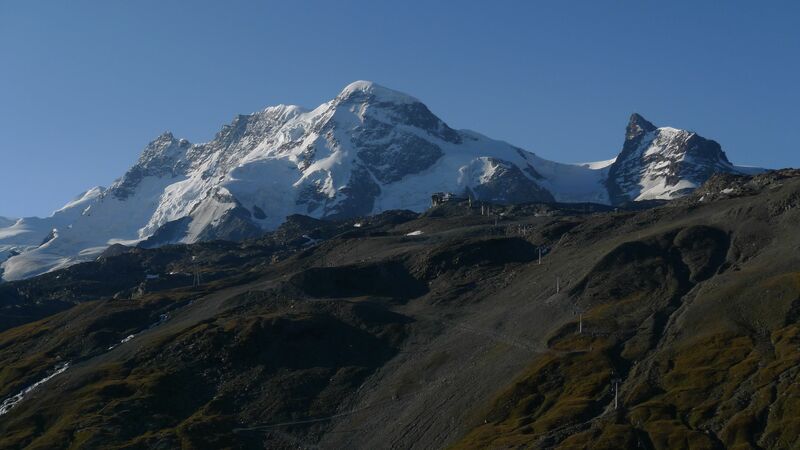 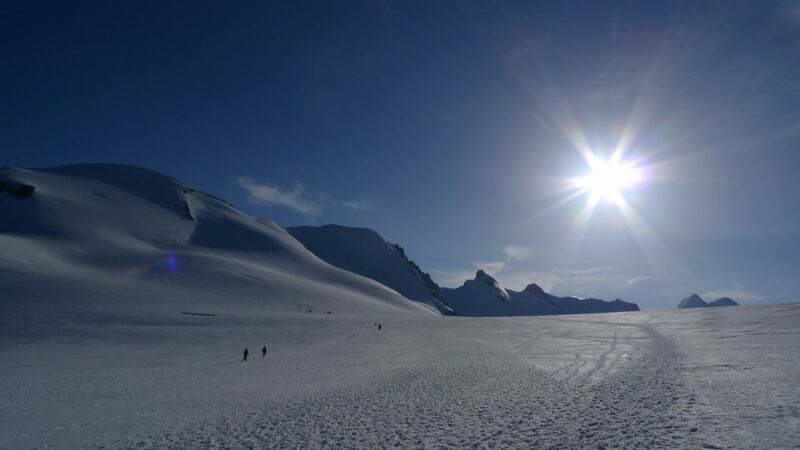 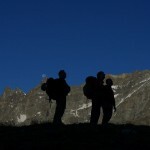 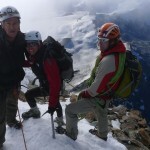 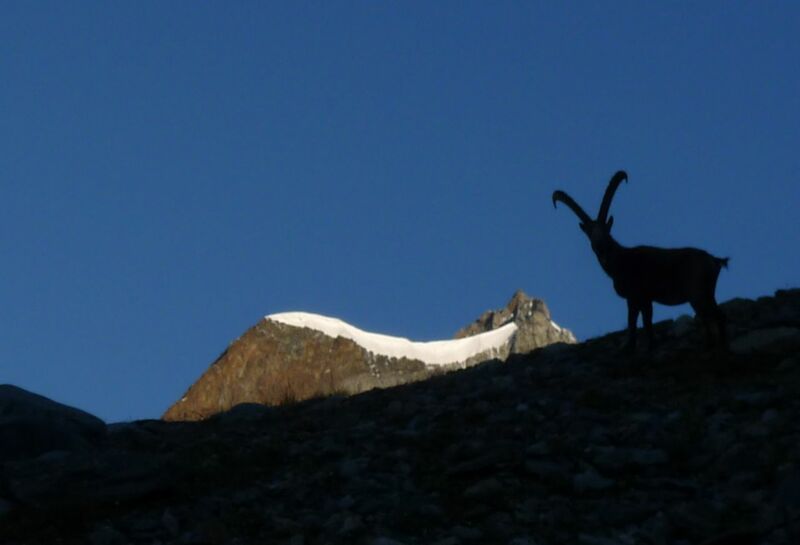 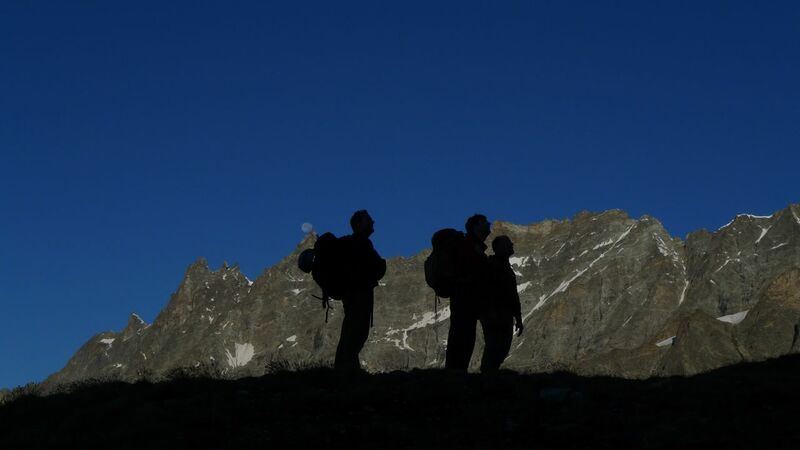 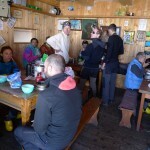 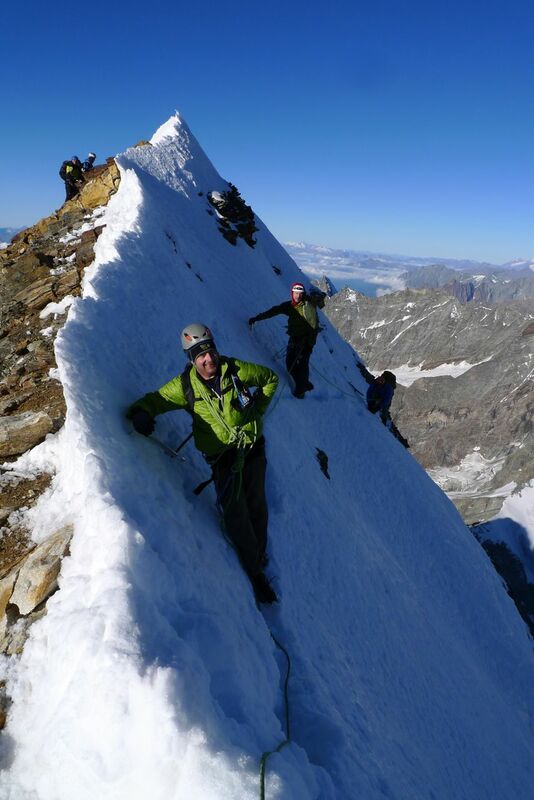 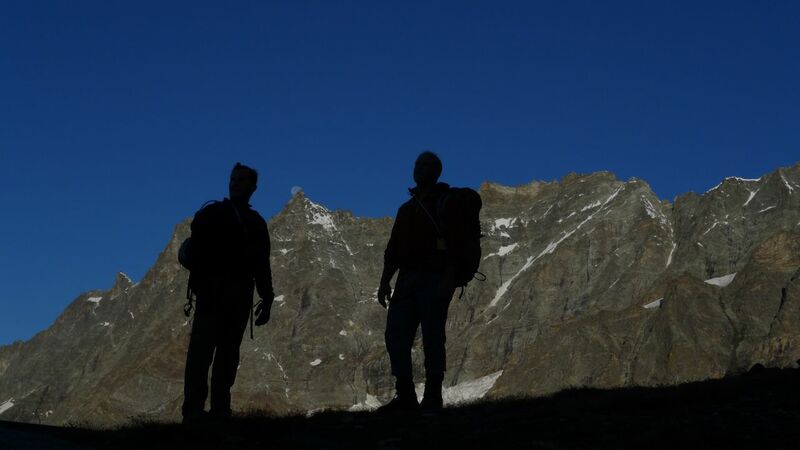 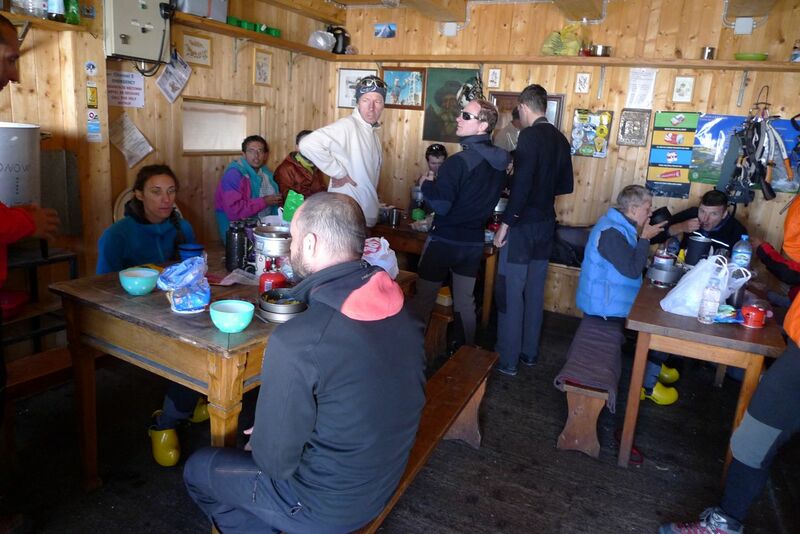 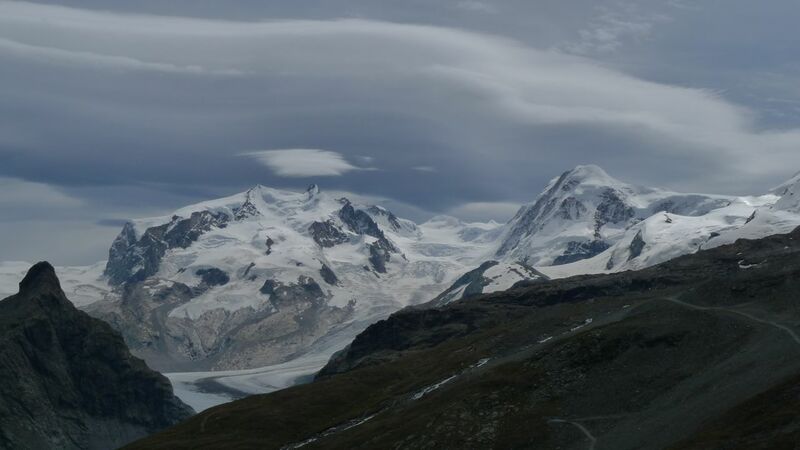 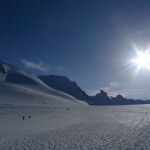 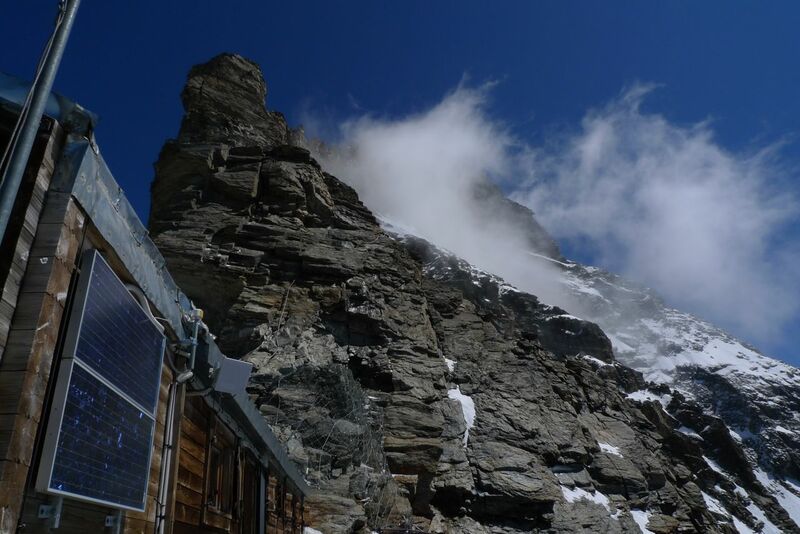 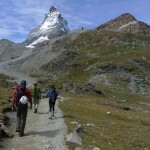 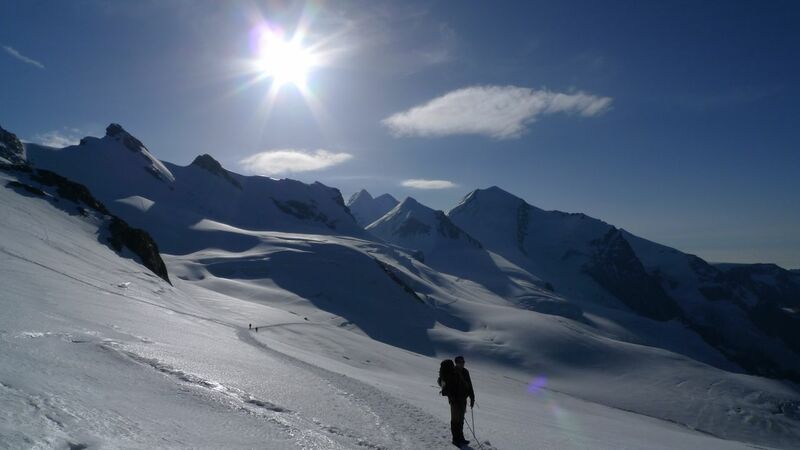 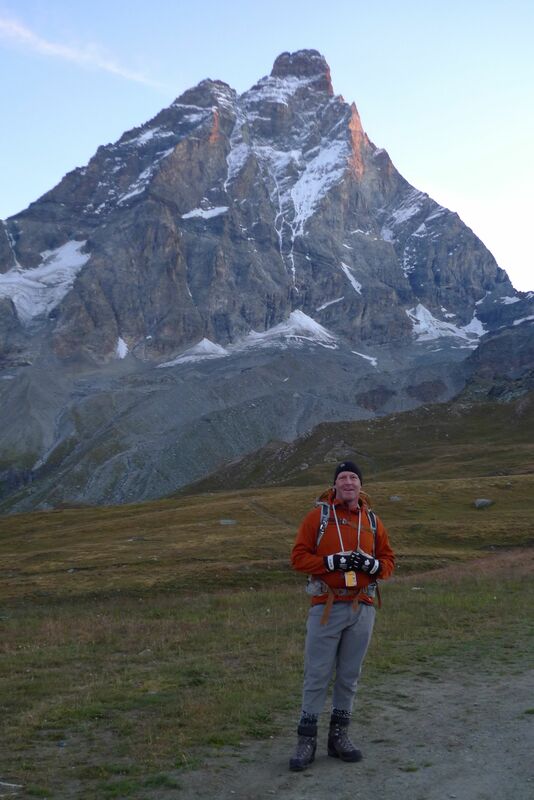 Common acclimatizing strategies are to climb Castor (4,223M) and Pollux (4,092M) and the Breithorn (4,159M) ahead of time and sleep high either at the Klien Matterhorn (3,883M)bunkhouse, the Refugio Guide V.d’Ayas (3,380M), or the small and crowded Rossi bivy hut (3,787M)). 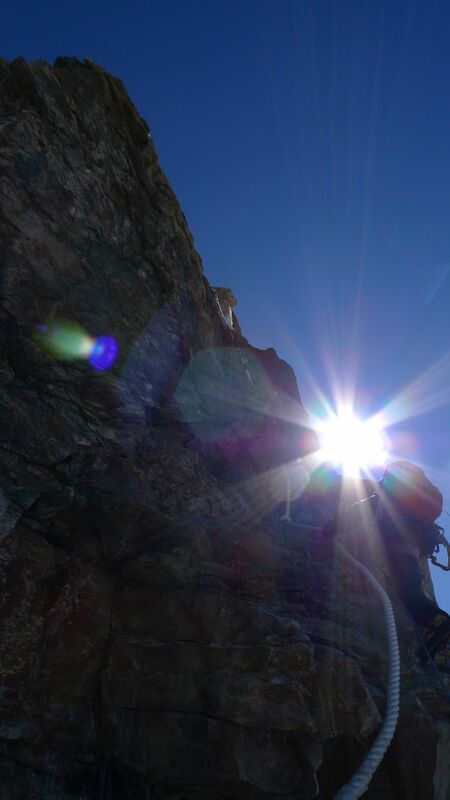 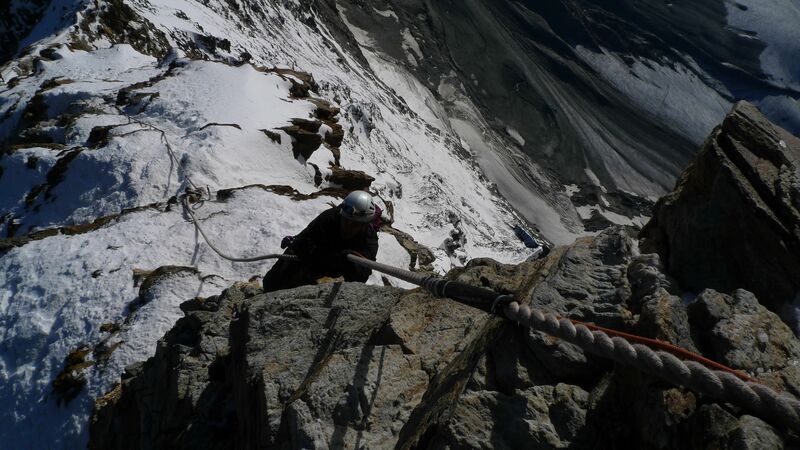 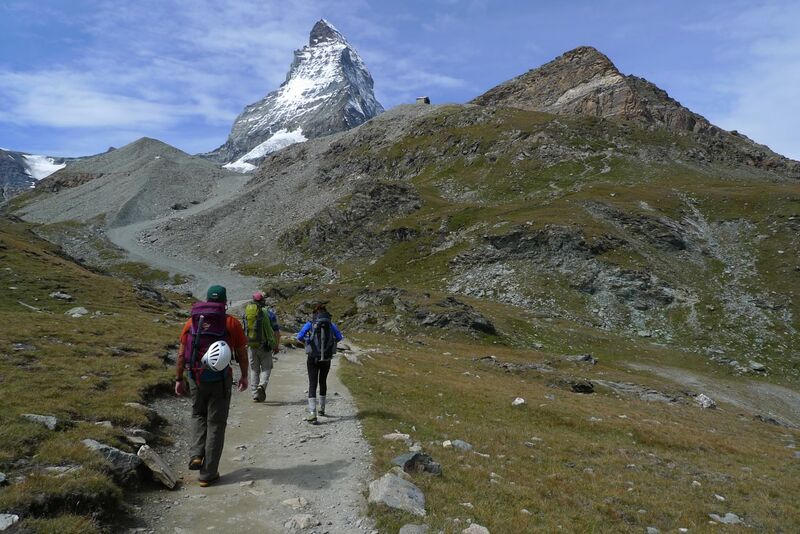 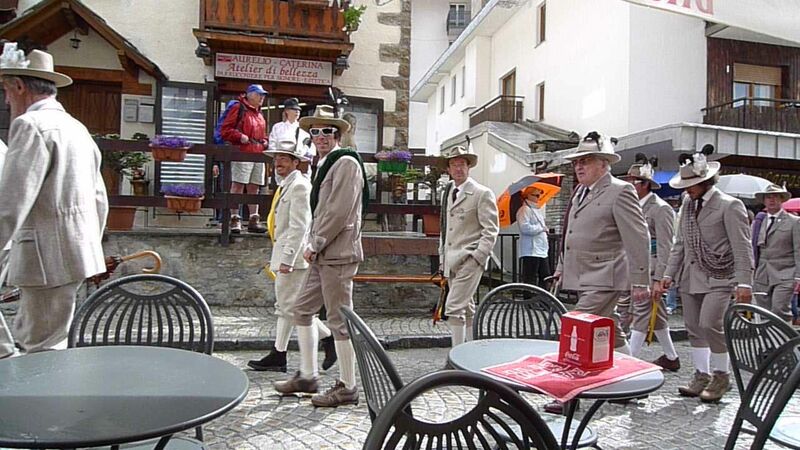 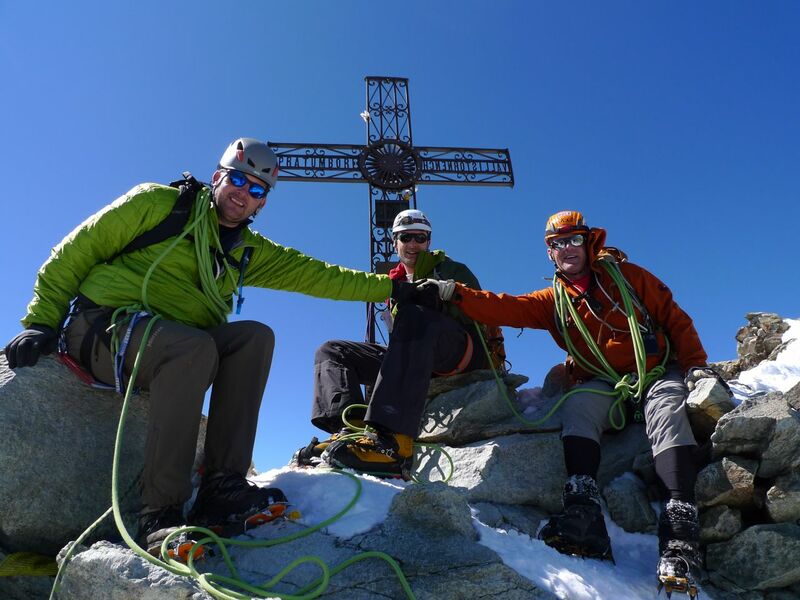 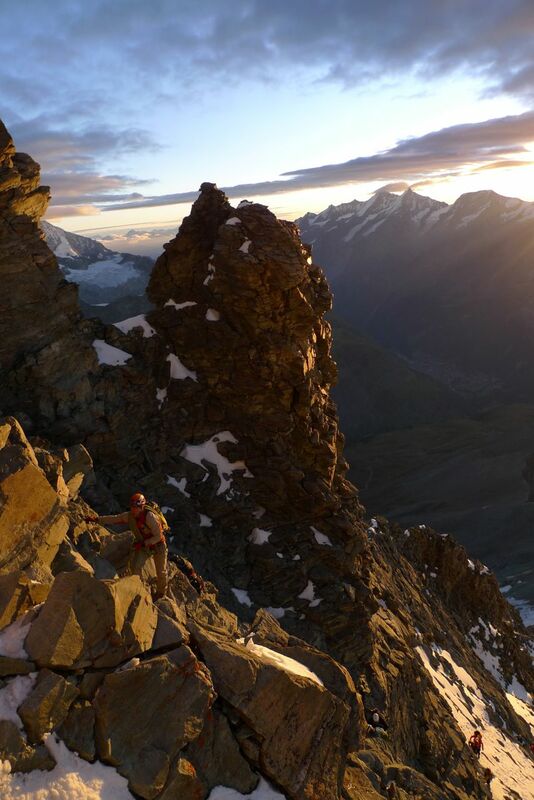 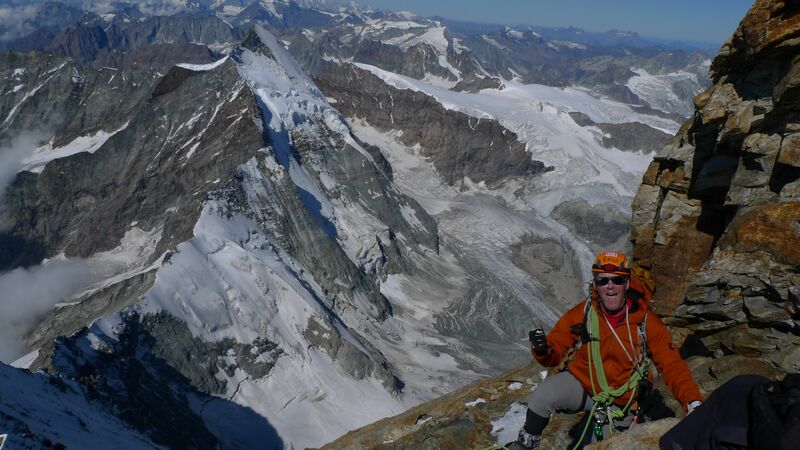 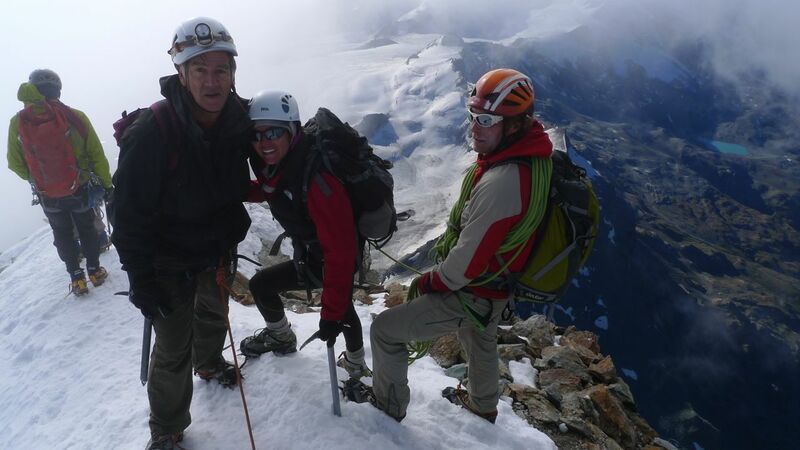 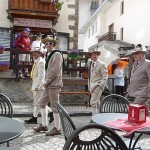 Both Zermatt and Cervenia are interesting mountain towns with quality lodging and food to be found and a rich climbing history to be explored on down days.